Built in 1911, this hilltop hotel is located across from the famous manmade Fateh Sagar Lake. Situated 3 miles from Udaipur Train Station, it features 3 dining options and a gym. 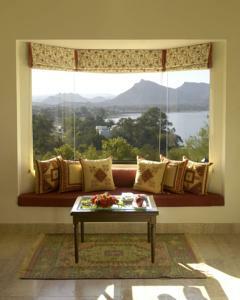 The LaLiT Laxmi Vilas Palace Udaipur offers rooms with a flat-screen TV and tea/coffee making facilities. An iPod dock and DVD player can be provided upon request. Rooms include work space and a sitting area. Activities at the hotel include billiards, croquet and indoor games. The AUM Shop sells a variety of souvenirs, books and fashion accessories. Tour arrangements and car rental are provided. Featuring a live kitchen and outdoor seating, Aangan restaurant serves Indian and continental dishes. Padmini restaurant features a variety of cuisines, while drinks are available at the lobby bar. The LaLiT Laxmi Vilas Palace Udaipur is 17 miles from Maharana Pratap Airport. It is one mile from the City Palace and Crystal Gallery. Rooms: Hotel Rooms: 55, Hotel Chain: The LaLiT Suri Hospitality Group. Wi-Fi is available in the entire hotel and costs INR 600 per 24 hours. Free! All children under 12 years stay free of charge when using existing beds. Free! One child under 2 years stays free of charge in a baby beds. One older child or adult is charged INR 2500 per night and person in an extra bed. Maximum capacity of extra beds/baby beds in a room is 1. Any type of extra bed or crib is upon request and needs to be confirmed by the hotel. Supplements will not be calculated automatically in the total costs and have to be paid separately in the hotel.